It was 1953, and he was 22 years old. His father's death prompted him to return from Oxford to take charge of the family business. He became the managing director of News Limited. And thus started the famed journey of Keith Rupert Murdoch, the Australian-American media magnate and the founder, chairman, and CEO of News Corporation. Image: News Corp chairman and CEO Rupert Murdoch arrives at the Sun Valley Inn in Idaho on July 9, 2010. Born on March 11, 1931, Murdoch turns 80 today. Beginning with one newspaper in Adelaide, Murdoch acquired and started other publications in his native Australia before expanding News Corp into the United Kingdom, United States and Asia. Image: Murdoch listens to a question during a session of the World Economic Forum in Davos on January 24, 2008. 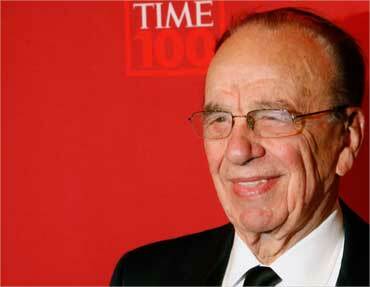 Murdoch was listed three times in the Time 100 as one among the most influential people in the world. He is ranked 13th most powerful person in the world in the 2010 Forbes' The World's Most Powerful People list. 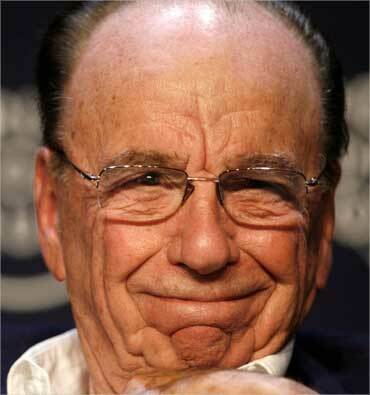 Murdoch, is now worth $7.6 billion, instead of the $6.3 billion recorded for the Forbes' 2010 list. Image: Murdoch arrives for Time magazine's 100 most influential people gala in New York on May 8, 2008. Murdoch has a history of hosting private meetings with influential politicians. Both parties describe such meetings as politically insignificant; social events, informal dinners or friendly drinks. It has however been argued that such meetings are significant because of Murdoch's exceptional influence as an international media magnate. 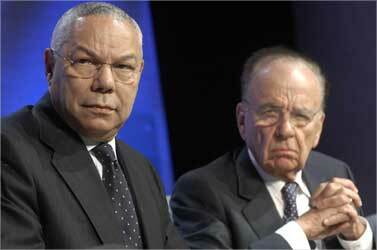 Image: Former US Secretary of State Colin Powell (L) and Murdoch. In 1956 he married Patricia Booker, a former shop assistant and flight attendant from Melbourne with whom he had his first child, a daughter, Prudence, born in 1958. Rupert and Patricia Murdoch divorced in 1967. Murdoch divorced his second wife (and the mother to four of his children) Anna Murdoch in 1998 after more than 30 years of marriage. He then went on to marry a member of his staff in the Asian operations (Star TV). Wendi Deng is roughly 40 years younger than Murdoch. Image: Murdoch and wife Wendi Deng at the 2011 Vanity Fair Oscar party in West Hollywood, California on February 27, 2011. Murdoch has always moved around the world to be near his business interests. From Britain, he relocated to the United States and became a naturalised US citizen in 1985. Talking about her son, Murdoch's mother Dame Elisabeth Murdoch, who turned 102 last month, says wealth and influence are not everything to everyone, adding she is proud of his son because he is a good father and a good son. 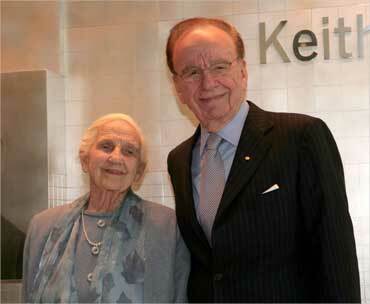 Image: Murdoch and his mother, Dame Elisabeth Murdoch, attend the opening of a new newspaper office building in Adelaide, Australia November 16, 2005. 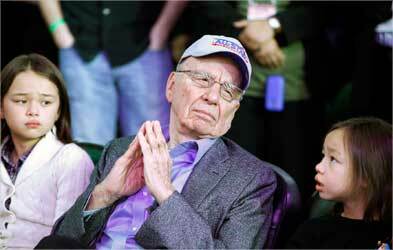 Speculation about Murdoch's retirement and succession planning has been rife for years. 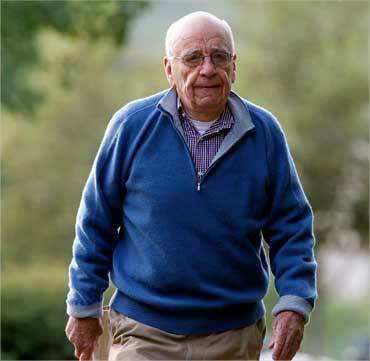 But Murdoch is showing no signs of slowing down as he readies to bag one of his life's biggest deals. Media reports suggest, News Corp is poised to win control of British broadcaster BSkyB with a pound 7.5 billion (about $12.2 billion) bid for the shares it does not already own. Image: Murdoch (C) and his daughters Chloe (R) and Grace (L) attend the NBA All-Star basketball game in Los Angeles on February 20, 2011.